I got some new milk bottles. They are so cute! 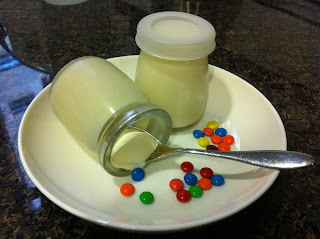 So I decided to make Panna Cotta with them. This recipe was given to me from my relative, Natalie. 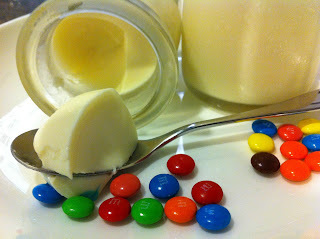 This is a super simple recipe, there is no need to use beaters or oven. YAY! Sprinkle the gelatin into the cold milk. It is important to sprinkle the gelatin so the gelatin can absorb the milk. Set aside for 5 - 10 minutes. Heat up the whipping cream and sugar until the mixture starts to bubble and the sugar has dissolved. Turn off the heat. Add in the gelatin mixture. Pour into the containers. Set aside to let cool. Chill in the fridge until they set. Easy recipe? hehe... Sometimes, I reduce the gelatin to 8g. Try it out and see which texture you like. I've tried your Panna Cotta, it's delicious and simple to make. I've also tried using with chocolate milk and it turns out delicious too. Thanks for sharing this simple recipe..